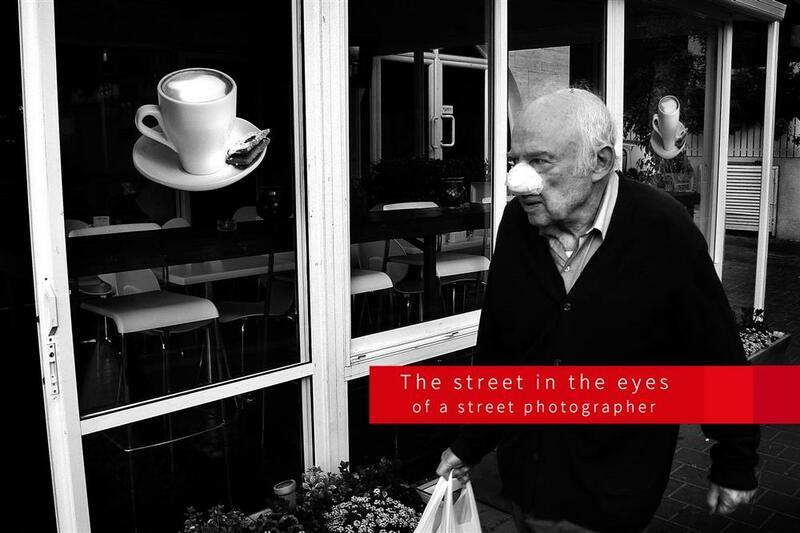 The street in the eyes of a street photographer / Felix Lupa. It all began many years ago, in the dense rain-forests somewhere in South America. A small, elderly spider opened his eyes in the dark. A battle-cry echoed in his little head. It was a basic, ancient insatiable instinct. When the stomach growls nothing will stop it. It is a basic instinct, not a movie. For him it is the nature of things- he strikes out to hunt! He crawled quietly out of his hiding-place, on his way to the endless hunting grounds, in the direction of targets he had marked when he was going here and there…never lazy, he had set small net-traps in strategic places: "by the time I am back the 'frige' will have filled up" he thought "and a bit to bite on the road never did one any harm". He moved quietly, his steps light, all his senses alert: he will strike out from his hiding place, paralyze his prey and disappear leaving no trace. "The place where no human foot has been set".This is how his birth-place was called, but now, alas, the worst had happened: a human foot was planted in front of his eyes! Scanning quickly the situation he raised his head: "there is no such animal" he thought "air force will be no good here. This battle will have to be decided face- to -face", and he stuck his teeth deep into the intruder's flesh. But alas, before he could complete his act he was suddenly struck by a heavy metal body bearing the strange letters "made in j…"
And this was the end of our little brave hero. Nevertheless, before he returned his soul to his maker he left his poisonous teeth, inserted deeply in that leg, inheritance to an amateur photographer from a small country, far away from there. Time passed, and our friend the photographer returned to the big city in his small country. The noisy streets suddenly seemed different to him. Everything looked and sounded different. Strange changes where taking place in his body: his eye- sight is now sharp. No longer does he bump into street poles that he fails to notice, as before. When he walks in the street he sees far and wide. His hearing, too, has improved wondrously: all of a sudden he hears the voices of the street, he understands its language. He goes out, camera in hand, his finger on the trigger- he sets out on a hunt, to photograph! Moving in the streets, he examines targets he had marked before, on his way here and there…he moves quietly, his steps light, his senses alert. He will strike out from his hiding place, freeze his prey and leave no trace. His "public eye" is always opened; he sees everything, good and bad. The street is the photographer's friend, but also his enemy. So are the street's inhabitants with their varying lots and differing modes of life. They are unpredictable, random, and spontaneous. They are sensitive and surprising, decorous and dangerous. With all of them the photographer has to learn to communicate, to understand their language, and recognize their signals and hints. This is not slang; it is a secret sign- language, a set of codes for behavior in society, the society of the street. The language of the street consists of signs, symbols, geometrical shapes; its signs are written on notice- boards, on posters, you will find them on sidewalks, on bus stations, street poles, in the cloths people wear, on public waste -containers, on buses. The street speaks through people's facial expressions, through their body–language, in the expressions of their physical and mental states, through expressions of relations among people, and between them and others. You will find the 'words' of the street in shoes, in hair-styles, in cloths and in fashion…every single detail you notice may be significant, meaningful. Understanding the street's language is not enough. The street-photographer's main occupation is a constant, unceasing, and stubborn search for a connecting line between the various signs of the street, so as to be able to translate these signs, arrange them visually for those who will look at his pictures. It is this constant search that nourishes the never ceasing tension in the street-photographer's work; it is what "fuels" him, spurs him on, what imbues his work with deep meaning. This is the core of his dedication for life as a photographer. What the street- photographer seeks in particular are connections between symbols and human beings. He strives to establish a link between some symbol, some icon, well known to all in his culture, and between a person (or persons, sometimes animals) who will combine with the symbol. A successful combination will result in a new angle of view, often surprising and inspiring, stirring thought and feelings, on some known reality. It will thus add value to the picture beyond merely recording reality at a certain fleeting moment. In the search for such a special, inspiring combination the main 'player' is the street-photographer's patience, though imagination, experience, and good understanding of human behavior are also necessary tools in his professional kit. Relations between people consist of diverse and numerous elements and these always maintain a certain tension between them. A successful capture, in a picture, of this tension will always touch the feelings of viewers and feed their imagination. We know that in certain cases where there is an emotional and spiritual understanding between two people they may understand each other without need for words, as if they had a telepathic link. In a similar manner, some photographers, who delved deeply in human behavior, and in the nature of their relationships, will develop a kind of 'telepathic' ability which enables them to anticipate the development of human situations, and 'capture' them at the decisive moment. We have to remember that people's actions are done, most of the time, in (more or less) regular patterns, common to all humans. Some of these are culture- bound; some others are even independent of culture and ethnicity. Body-language is a much discussed and investigated topic the observations of which bear out the above statements. In similar situations we tend to do more or less the same things, and in the same manner. If, for instance, we look at an average person and observe her (or him) in the street for a certain time, we will see that in ordinary circumstances their behavior will be pretty much the same as that of others. However- and this is what the street- photographer always lays in wait for - if we are patient enough, we will witness the person under our observation do something exceptional, out of the ordinary: something funny, ridiculous, moving, heart touching , stupid, strange, crazy…The street-photographer is helped constantly by his familiarity with human-behavior patterns, but the 'pearls' he is after, towards which he direct his greatest 'hunting energy' , his 'special treasures' are those peculiar, strange, out of the ordinary, crazy moments. It is by the capture of such moments that the street-photographer manages to express his view of the essence of humanity as he perceives it. We are all aware of the existence of behavior patterns in society, but not everybody is familiar with of the value of these exceptional, deviating situations, or able to identify and anticipate them. The ability to do this, is what enables the good photographer, the "spider of the urban jungle" to capture those special moments which, made up of basic and simple human elements, ignite our imagination, brings to us deep some memory, perhaps a primordial experience shared by all humans, but told by the photographer in his own particular artistic language . The memory and the experience are shared by all, but the "chef" who concocted the "dish", gave it its special flavor, is the street photographer. The street photographer is often treated as an eccentric, a "strange bird", sometimes he is looked at with suspicion, even with fear, sometimes he draws out aggression from people. Indeed in the world we live in now he seems sometimes to be endowed with something like supernatural powers: through his photographs he may have far reaching influence on the life of people: An occasional, unintentional capture of a married man cuddling with a blonde beauty in a night-club, an accidental snapshot of a bank robber at work, may serve as evidence in a divorce case, or lead to an arrest, respectively. An innocent photograph taken at a market place may give raise to suspicions against the photographer, who may be suspected of being an agent of income tax, or health authorities or some other authority. A photographer taking photos of children in public parks may be suspected of pedophilic intentions. These are only a few examples, the list is very long. The reasons for these negative attitudes are many and complex, but it is a fact that they often turn the photographer into a nuisance, even an enemy in the eyes of people. Nevertheless, the photographer perseveres, not only because he has got "the poison" in his bones, but because as an artist and reporter he fulfills an important function in the life of society (and especially here in Israel, where society is still undergoing many and deep formative changes): to make people, both inside and outside, aware of how we look. The photographer observes, photographs, and shows us how we seen from his particular point of view. What is to be done with this information is not up to the photographer, it depends on us, as individuals and a society to decide what to do. In my wanderings in the streets of Tel Aviv I chose to show places known to us all from my own particular point of view. I wanted to share with you, in this short piece, my love to the street and my feeling that the street is a 'breeding house' for all manners of emotions, for a great variety of experiences. Life streams, gushes in copious currents in the city's streets, its alleys, in neighborhoods, on all levels of society. We only have to stop for a moment, observe and contemplate, listen to what says the street, to wait patiently, and we are sure to draw out of this rushing river surreal moments, moving sights, sad, and smiling, happy and serious, wise or ridiculous visual stories. To me, the street is not only the space of "urban jungle", the best hunting ground for the spider/photographer; it is also the best show in town.